and went out sketching today. Parked my car in a parking lot at Cermak and Central and spent about 2 hours sketching this. 5" x 7" Pencil and watercolor. Hello! I joined Urban Sketchers Chicago in May, and I am so happy I found them! I love the fact that an Urban Sketcher can travel to all parts of the globe and find sketching friends everywhere. That said, my sister and I traveled all the way to Springfield, Illinois last week. I did not meet any urban sketchers, but I did a little sketch on the train. Maybe next year we will go farther afield - but there are always things to sketch, even from the kitchen window! Sunny and almost 70 degrees. I used Tombow water soluble brush markers for this sketch of the Pier and boats. Here's a link to the history of Navy Pier: http://www.navypier.com/about/history.html. Here's a morsel from the history website. Pilot training orientation commenced at Navy Pier. Eventually, 15,000 pilots were qualified for military service, including a young airman named George H.W. Bush, the future President of the United States. As many as 200 WWII planes still rest at the bottom of Lake Michigan as a result of accidents during training. This is a sketch of Frank Lloyd Wright home in Oak Park IL. 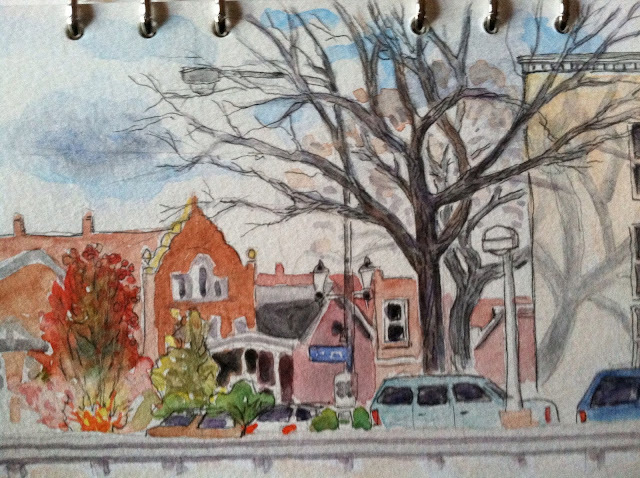 We sketched it at our September USK Chicago meet.